Buying a home in Medina Sidonia for the majority will be an emotional decision rather than a necessity, the chances are you are looking for a place to escape, a place to unwind and a place to dream a little. “As well as owning the hotel I also have a small real estate site where I dedicate myself to finding special properties in the old historic part of town for clients who have fallen in love Medina as much as I have”. For those who seek a property in this little known part of Southern Spain full of authentic charm, the individually chosen homes for sale at Medina Sidonia Properties offer modern conveniences and building standards combined with delightful period features that give each of the properties their own personality and appeal. We also focus on renovating old historic buildings which have been subject to the beatings of time and can be turned into a sanctuary of peace and tranquility. We wish to "Bespoke Design", Medina Sidonia Properties are marked by the attention to detail that goes into their restoration and styling. They also stand out for their individuality, featuring quality construction and personalised touches that make each project unique. We ensure a "Smart Build", the best materials are sourced throughout Spain and combined with the highest construction standards to ensure that Medina Sidonia Properties not only look beautiful, but are also solid, durable, comfortable and easy to maintain. Creative skill is matched with technical know-how through our professional building and architectural firms – a partnership that produces a seamless final concept from design through to execution. Whenever possible original materials are used and restored, with retired masters training a new generation of skilled workers to ensure the historic features of all our properties are redeemed to the highest standard. We champion historic features in all our properties because they create a timeless value that reinforces every property's character and uniqueness. 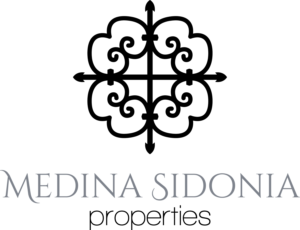 We make your "Individual Requirements" a priority, Medina Sidonia Properties is a small business offering a personalised approach, dedicated to finding you the right home for your lifestyle. But the commitment doesn't end there it continues beyond the purchase process with a personalised management and maintenance service that offers optimal value for money and ensures complete peace of mind over your investment. We hope you enjoy a video with a brief preview of Medina Sidonia.